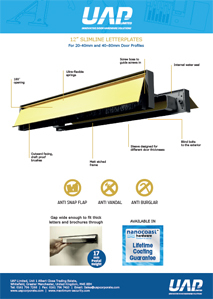 The UAP Anti Vandal 300mm 12 inch slimline letterplate comes with both an external and internal flap to protect your customer’s homes, and is designed for 40-80mm for composite and wooden doors. The cavity hole dimension to drill into your doors in order to fit the slimline letterplate 10 inch letterplate is 247mm x 28mm. 1 – Having brushes on the front of the door acts as a visual deterrent to vandals. As the internal cavity is not easily accessible, it makes it a lot harder to put lit fireworks etc. into the cavity. PVD gold, mirror polished and satin stainless finishes are part of the Nanocoast range. These products are made from 316 grade stainless steel, and are specifically designed for areas which are within a 25 mile radius of the coast, or within 5 miles of highly populated industrial areas. Unlike brass and zinc based products, the Nanocoast products will not pit, rust or corrode no matter what environments you put them in. This means that the products will last longer, and keep your customers happy. 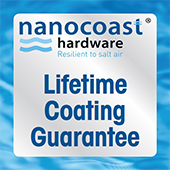 What’s more, every Nanocoast product comes with a lifetime coating guarantee! 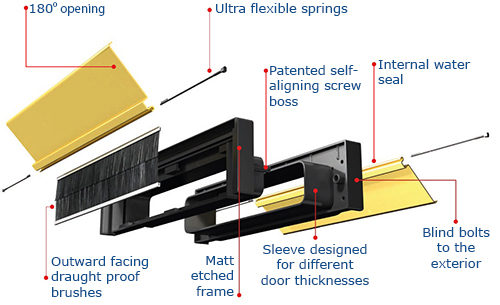 By replicating the action of opening and closing the letterplates flaps, the machine can determine the durability of the hinge mechanism on the product. The flaps are repeatedly opened and closed to ensure they can withstand thousands of openings without snapping or breaking, promising a product that will last much longer than others in the industry. The process is repeated to 100,000 repetitions – with only 15,000 required by testing standards. Tests are performed in accordance with BS EN 13724:2013. 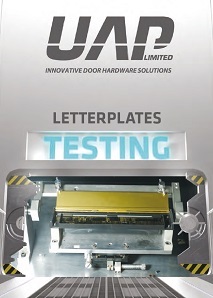 UAP Ltd distribute a wide range of letterplates, with flaps made from aluminium and Nanocoast 304 or 316 grade stainless steel. Coating Guarantee = the sooner of “the guarantee supplied for the door or window from the manufacturer” or “5 years inland” on aluminium based flap letterplates or “Lifetime” on Nanocoast 304 or 316 grade stainless steel based flap letterplates. 1. The letterplates are applied to a door or door panel, and no item of door furniture on the door or door panel are sealed or fixed using any form of silicone sealant or the like. 2. The letterplates are fixed correctly and the right way around with the brushes facing to the outside using the correct fixings, and are not scratched or damaged at any time during the installation process or thereafter. 3. Nanocoast 304 or 316 grade stainless steel based letterplates are cleaned with a lemon based very mild soap solution and a soft cloth once a month, or every 2 weeks in areas of high sea salt such as coastal areas. At no point should any form of cleaning agents be used. 4. Aluminium based letterplates are installed inland (defined as 25 miles from the coast or 5 miles from highly populated industrial areas) and are cleaned monthly with a moist cloth. At no point should any form of cleaning agents be used. 5. No claim will be accepted for any letterplate that is scratched or mutilated or fitted incorrectly. 6. The guarantee only applies if the letterplate is fixed to the original door for which it was bought and fitted by the installer. 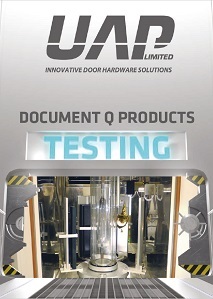 The guarantee will cease immediately if the letterplate is removed from the original door or door panel. Mechanical Guarantee = the sooner of “the guarantee supplied for the door or window from the manufacturer” or “5 years inland” on aluminium based flap letterplates or “10 years” on Nanocoast 304 or 316 grade stainless steel based flap letterplates. 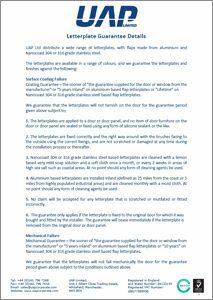 We guarantee that the letterplates will not fail mechanically the door for the guarantee period given above subject to the conditions outlined above.